THE NEXT POWDER COATING GUN IN THE NITRO FAZE SERIES IS THE NITRO FAZE CUP GUN. 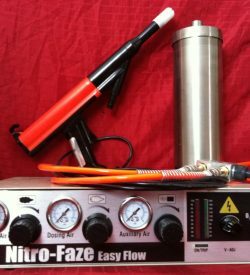 BUILT WITH THE SAME POWERFULL ELECTRONICS AS THE NITRO FAZE EASY FLOW, BUT IN A SMALLER PACKAGE. THE CUP GUN IS EXCELLENT FOR THOSE SMALLER PROJECTS AND MULTIPLE COLOR CHANGES. AN EASY TO USE AND UNDERSTAND THIS CUP GUN IS PERFECT FOR THE HOBBYIST OR SMALL PROFESSIONAL CUSTOM COATING SHOP. 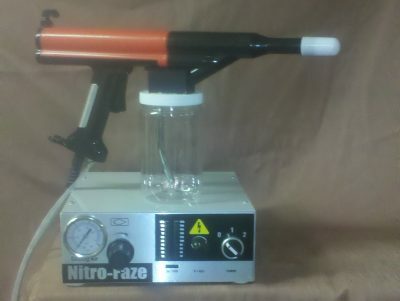 IT IS ADJUSTABLE TO 100 KV`S AND DESIGNED TO PREVENT POWDER SURGES, THE NITRO FAZE CUP GUN CAN EASILY COAT THOSE DIFFICULT PROJECTS AND SECOND OR THIRD COATS COLD ARE A BREEZE.  DON`T BE FOOLED, THIS LITTLE GUN WILL POWDER CIRCLES AROUND ANY COMPETITORS CUP GUNS. AS ALWAYS YOU ARE BUYING A GUN THAT IS 100% BACKED BY P365 WITH A 1 YEAR WARRANTY.